Almost 9 years ago, I started my spiritual journey. At that time I started taking yoga and meditation classes. During one of those classes, I was introduced to the yantra. Since then, it's been the most personal and meaningful form of meditation practice for me. On the right is the first yantra I encountered. This yantra is called the the Chinnamasta yantra. Chinnamasta is a Hindu goddess who chopped off her head. I later found out it was quite appropriate to be drawn to this particular yantra, not because I wanted to chop off my head, but because this form of meditation practice truly resonated with me. The act of cutting off one’s head actually represents cutting off your five senses so as to attune your intuition (your sixth sense) and reaching enlightenment. While creating a yantra, I can truly sit still and concentrate. Everything falls away and time disappears. So, what is a yantra? 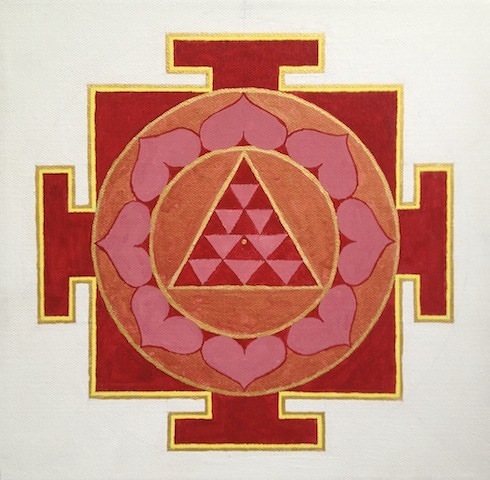 A yantra is a physical manifestation of a mantra from Vedic tradition. They are a type of prescribed mandala because the colors, shapes, and proportions have been pre-determined. Each yantra always consists of the same colors, even closely matching the tone and shade of each color is significant. For Instance, just above is the Tara yantra. Tara yantras always look the same. 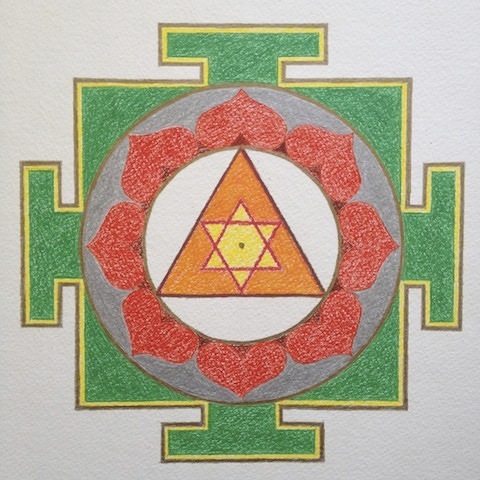 The design around the yantra is my own, but the actual yantra requires no artistic decision-making.In the process of creating a yantra, you start at the center, and then expand to draw a circle. Then you draw clockwise, from the outside in, until you reach the center again. You chant the associated mantra as you circumbulate the yantra. The movement and chanting is a clockwise tightening to build a powerful talisman. You can see that yantras use a balance of shapes and colors, so they form balanced and harmonious chi. They have all have the bhupur, the circle, and the shapes and colors of at least a couple different elements. Also, as I just explained, when a yantra is created it is imbued with the intention and energy of the mantra, and the deity and energy that has been prescribed to it. The following are three examples. The colors and shapes represent the wood production cycle. We start with the green wood, then red fire, and then the center with the yellow earth. Because Ganesha is ideal when starting new things, I relate this yantra to the Zhen/New beginnings gua (area of the Bagua, the Feng Shui Map), and the element of wood. Ganesha also had his head cut off by his father Shiva, while protecting his mother Parvati. Similar to Chinnamasta, Ganesha became enlightened when his head was cut off, and he was able to see that he was the same as his mother and father. Therefore resolving family issues. Which again brings us back to Zhen. 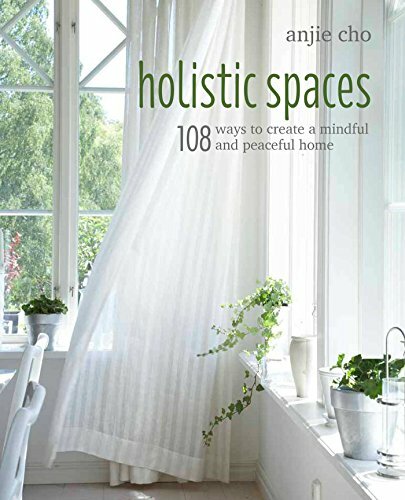 As a feng shui adjustment, the Ganesha yantra may be placed in the Zhen area of your home, office or bedroom for assistance in starting new endeavors or family issues. In Hindu, the planet Venus is feminine, having to do with relationships, love and higher love. Venus is considered a beneficent planet and associated with the reproductive organs. The cascading squares looks like they’re sinking, falling, it’s very womb-like. The pale yin colors, delicate pink lotus petals and square earth shapes suggest the Kun/Relationships gua and the element of earth. The pale blue of wood and the gold and silver colors of metal offer the two elements that deplete earth. So this yantra may harmonize an excess of earth. As a feng shui adjustment, the Venus yantra may be placed in the your bedroom, since that’s the room that’s closest to you, to assist with relationships as well as self-love and self-nourishment. Mars is a planet that is associated with masculinity, anger and war. It’s also a planet related to instability such as of fire. The reds and triangles are also related to fire energy and the Li/Recognition gua of the bagua. The central upward pointed triangle represents growth, as do the more dominant red interior triangles. This suggests that an excess of fire may be transformed into a more positive and productive direction. note: the images I've shared here are all yantras that I've made myself.